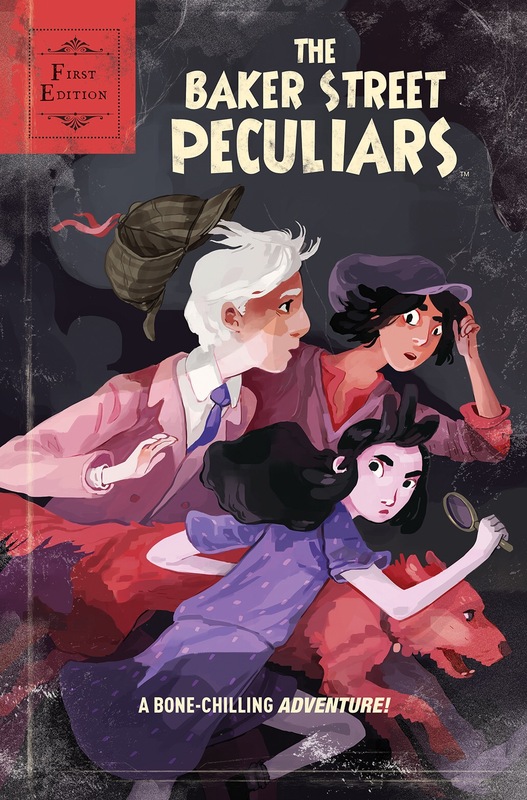 Set for release next month, THE BAKER STREET PECULIARS is a brand new series from award-winning publisher BOOM! Studios that asks “what if the world’s greatest detective wasn’t quite what he – or she – seemed? Written by all-ages mainstay Roger Langridge (Abigail and the Snowman, The Musical Monsters of Turkey Hollow) and featuring artwork from Andy Hirsch (Adventure Time, Garfield), the series grabbed our attention from the very first moment we read the solicitations, and we were absolutely thrilled to be able to sit down and have a chat with Roger and Andy about what readers should expect from this one. BIG COMIC PAGE: Thanks so much for your time, gentlemen. Now, for any of our readers out there who may not be aware, can you give us a brief idea of just what THE BAKER STREET PECULIARS is all about? 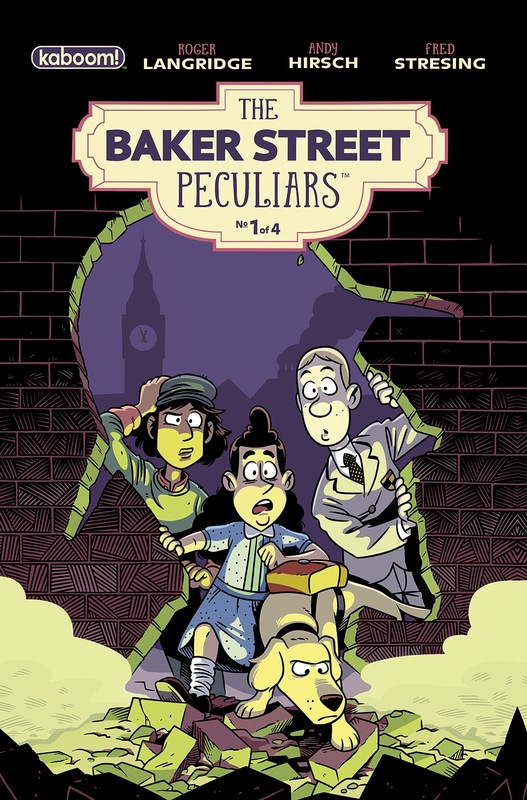 BCP: Where did the idea for this one come from, and what was it about the world of Sherlock Holmes that you thought was ripe for the all-ages treatment? LANGRIDGE: BOOM! Studios asked me and Andy to come up with something for them and suggested a gang of kid detectives as a possible starting point. 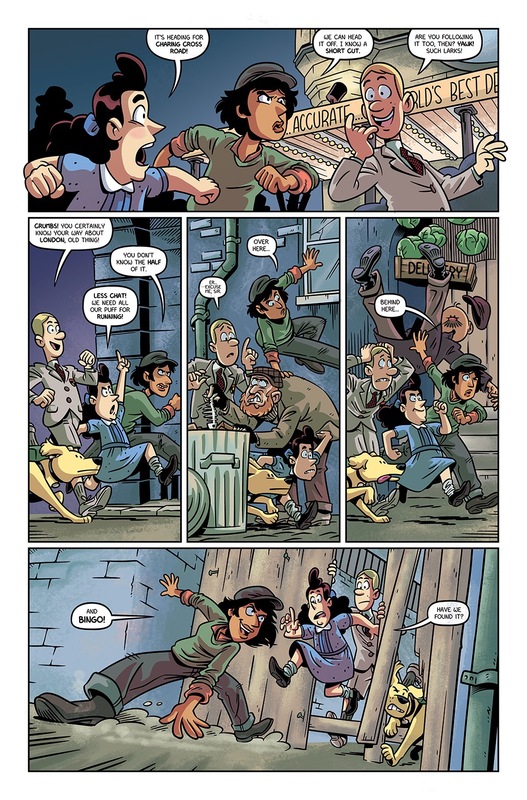 When I hear “kid” and “detective” in the same sentence my brain automatically goes straight to Sherlock Holmes’ Baker Street Irregulars; I thought the Holmesian angle would be a hook that might get people to look at it—everyone’s heard of Sherlock Holmes!—so we started building it up from there. BCP: Can you tell us a little about the “peculiars” themselves? Who are they, and what are their backgrounds? LANGRIDGE: There are essentially three of them (four if you count the dog): there’s Molly, a book-loving Jewish girl whose grandfather owns a tailor shop in Brick Lane, desperate for a proper education and a career; Rajani, an orphaned girl of Bengali descent, a street thief and a loner, for whom the only way is up; and Humphrey, a posh boarding-school boy (whose dog, Wellington, is his valet) who’s starting to question the fundamental assumptions underlying his whole cosseted, privileged life—especially once he meets the girls. BCP: How did the pair of you end up collaborating on this one? LANGRIDGE: We had been in contact for a while already, as mutual fans of one another’s work. but when BOOM! asked me to do something new for them and it seemed I didn’t have time to draw a new book right away, BOOM! suggested the two of us do something together. I love Andy’s stuff so I was keen to have him involved as a co-creator, and he brought some really useful suggestions and great character designs to the table. Worked out splendidly all around. ANDY HIRSCH: That email was a pleasant surprise, for sure. When Roger Langridge asks if you’d like to collaborate, who would say no? He’s great! I have him to thank for putting me in touch with BOOM! in the first place years ago, and it was incredibly gratifying to find I’d gone from one-off variant cover artist to series co-creator. I couldn’t be prouder of how the whole project has come out. BCP: You’re both extremely talented cartoonists in your own rights. Was it easy to find shared vision for the visual aspect of the book? LANGRIDGE: Thank you! I’ve been just sitting back and watching a whole lot of amazing pages come in, really. It’s not how I would have drawn it, but I think that’s really the point of collaboration anyway; Andy’s got his own strengths and he should play to those. I couldn’t be happier with how it’s come together visually. It’s usually been much better than what was in my head. HIRSCH: Thanks, that’s awfully kind of you. I’ve essentially had free reign over the visual side. Of course, Roger’s work has been a big influence on me, so he’s there in spirit. He’s also helped point me towards good reference material of pre-Blitz London, which, from 2016 Texas, may as well be Atlantis. And I’d be remiss not to mention Fred Stresing, whose fantastic color work is really the cherry on top. BCP: Roger is used to providing his own artwork on the books he creates, so how much freedom were you given, Andy, in terms of things like character design? HIRSCH: The characters’ backgrounds and personalities dictate their looks to some degree, but aside from those initial descriptions I really got to do what I pleased. That was a nice challenge since the setting is new to me. Because the full scripts were written with the designs already in place, it’s been fun for me to get to read the kids’ banter reflecting their looks. BCP: How does your art style for this one compare to your other work on licensed properties like Adventure Time, Garfield, and Regular Show? HIRSCH: It’s a shift, that’s for sure. Moreso from Garfield than the others since my work on that book was on model. Luckily, I’d just come off a year of working on a book of my own before starting this one and was well adjusted to drawing like myself again. Peculiars lets me indulge my love of detail and textures, and the setting lends itself well to nice, dark shadows. And by the end I really get to pack the thing with… well, spoilers, I suppose. BCP: Is the series planned for a limited run, an ongoing, or are you guys going to wait and see what the reception is like first? Based on the first issue, this definitely seems like a series that could run and run. HIRSCH: Oh, absolutely! It’ll depend what the reception for this series is like (preorder code JAN161196), but I’d jump at the chance to do more. That said, we certainly won’t be leaving readers with an unfinished story, and these four issues have a really lovely ending. BCP: What should readers expect from the series as it moves forward? Any characters or moments we should be keeping an eye out for? HIRSCH: Action! Mystery! Goofs! Heartfelt emotion and genuine growth! There’s a bit in the second issue featuring Lord Horatio Nelson (of column fame) that I’m really fond of, and the aforementioned Plank and Jones are delightful whenever they make an appearance. BCP: And finally, what would you say to a reader who still isn’t sure whether they’re going to pick this one up or not in order to convince them? LANGRIDGE: While there are things here to reward Holmes fans, prior knowledge of the Sherlock Holmes canon is absolutely not required—this series is very much its own thing, and easy to follow if you’re not a Conan Doyle buff. I like to think I got the balance right between rollicking adventure and characters you can care about—certainly that was the intention—so story-wise it should be pretty involving. And the art is absolutely glorious! 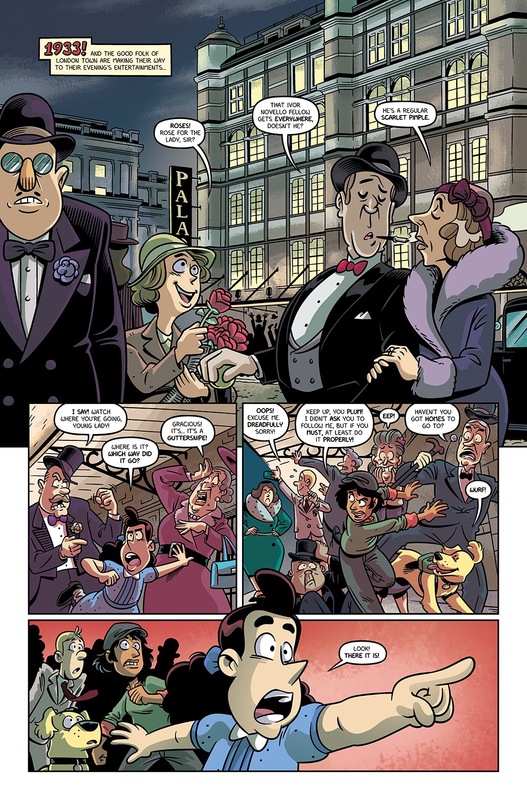 Andy has evoked 1930s London magnificently, and Chippy Kipper is my favourite character design in forever. BCP: Thanks again for your time, gentlemen. 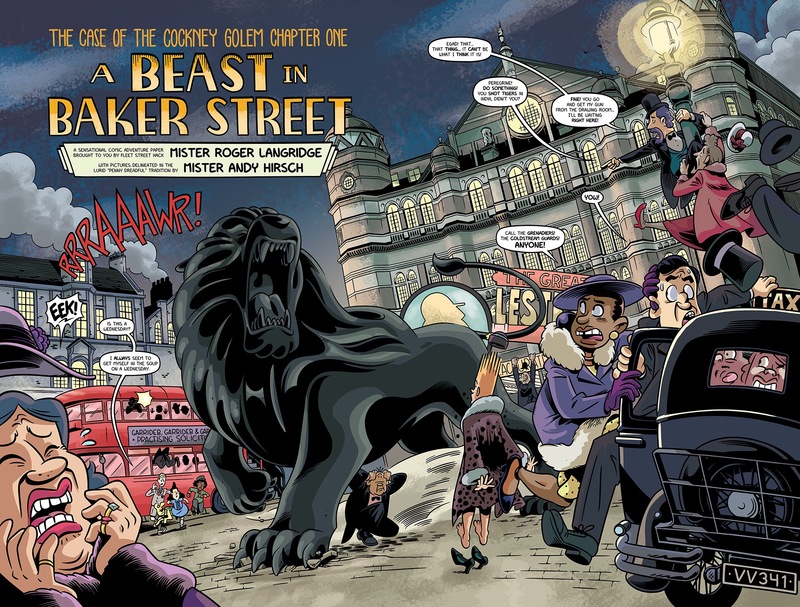 THE BAKER STREET PECULIARS #1 goes on sale Marcy 9th from BOOM! Studios, priced $3.99. Keep your eyes peeled for a review of the first issue right here on the Big Comic Page in the very near future.